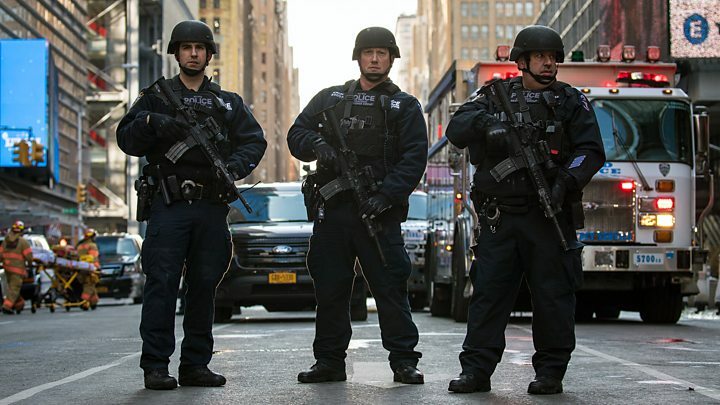 A man is being held after an attempted terror attack at New York City's main bus terminal. 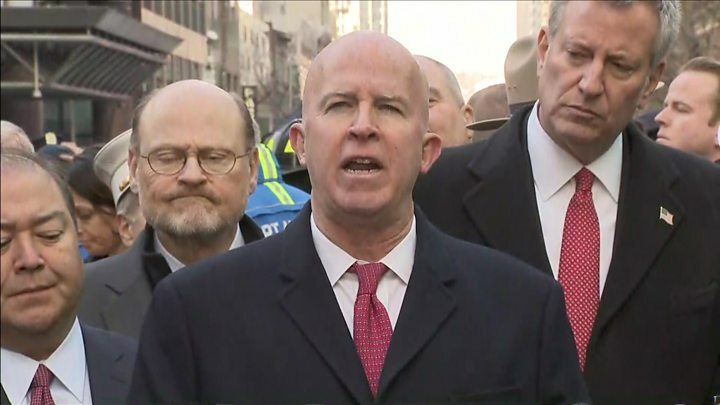 "Terrorists won't win," Mayor Bill de Blasio said after a blast at the Port Authority terminal in Manhattan during the morning rush hour on Monday. The suspect, Akayed Ullah, a 27-year-old Bangladeshi immigrant, was injured by a "low-tech explosive device" strapped to his body, officials say. Three other people suffered minor wounds when it blew up in an underpass. A photo circulating on social media shows a man, said to be Akayed Ullah, lying on the ground with his clothes ripped and lacerations on his upper body. Mayor De Blasio said he was believed to have acted alone. New York Governor Andrew Cuomo said: "This is New York. The reality is that we are a target by many who would like to make a statement against democracy, against freedom. "We have the Statue of Liberty in our harbour and that makes us an international target." The explosion occurred at about 07:30 (12:30 GMT). Andre Rodriguez, 62, told the New York Times: "I was going through the turnstile. It sounded like an explosion, and everybody started running." Another eyewitness, Alicja Wlodkowski, told Reuters news agency that she had seen a group of about 60 people running. "A woman fell. And nobody even went to stop and help her because the panic was so scary," she said. The suspect's home in the New York City borough of Brooklyn is being searched, the New York Times reports. Mr Ullah emigrated to the US on a family visa in 2011. The Bangladeshi government said he had no criminal record in the country, which he last visited in September. White House spokeswoman Sarah Sanders claimed that if Mr Trump's proposed immigration crackdown had already been in place, "the attacker would have never been allowed to come into the country". "This attack underscores the need for Congress to work with the president on immigration reforms that enhance our national security and public safety," she added during a daily news briefing on Monday. October 2017: An Uzbek immigrant drove a truck into pedestrians, killing eight people. He is facing murder and terror charges. It was the deadliest attack in the city since 11 September 2001. September 2016: An Afghan-American man planted pressure cooker bombs in New York and New Jersey. He was shot by police but survived to face court. October 2014: A Muslim convert was shot dead by police after attacking two officers with a hatchet. Police said he had become radicalised and the case was "a terrorist act". May 2010: A car bomb was found in Times Square, the city's busiest tourist area, and defused by police. A Pakistan-born US citizen was arrested and sentenced to life in prison in 2010.